This article is about the summer summon stone. 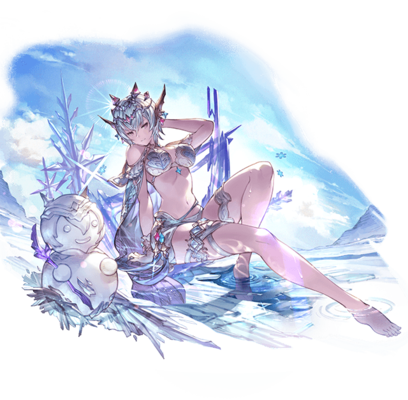 For the regular summon stone, see Macula Marius (Summon). For the recruitable character, see Macula Marius. For the raid, see Macula Marius (Raid). A beautiful maiden of soft petal snow alights on sun-kissed shoals. Her caprice determines who is fortunate enough to be granted sanctuary from the withering heat, but delighting in a Sky Realm summer is entirely her prerogative. 60% boost to Water Elemental ATK. 80% boost to Water Elemental ATK. 90% boost to Water Elemental ATK. Massive Water damage to all foes. Duration: 1-2 turns on all Fire foes for 1 to 2 turns. 3T3-turn cooldown at the start of battle. 9T9-turn cooldown upon call. Duration: 1-2 turns on all Fire foes for 1 to 2 turns. 日差しが辛いか？　隣人よ。ならば、妾の胸に飛び込んで来るがいい。すぐに暑さなど、忘れさせてやろう Is the sunlight getting too hot for you to bear? If so, then dive into your lover's bosom. The summer heat will soon be forgotten. ふむ。戯れで作ってみたが、思いの外雪像は浜辺に映えるのだな。隣人も作ってみるか？妾を満たす逸品を作れたならば、とっておきの褒美をくれてやろう。褒美の内容は、作れてからのお楽しみだ Hmm. I made it in fun, but my snow sculpture looked surprisingly good on the beach. Might you also wish to make one, skydweller? Should you make some masterpiece which pleases your lover, I might give you some treasure of mine as a prize. The contents of that prize: the joy of creating. This page was last modified on 17 April 2019, at 00:35.